MISSION, KS--(Marketwire - January 3, 2011) - (Family Features) One in every ten Americans has hearing loss. Yet research indicates that most wait up to ten years before seeking help. While 95 percent of Americans with hearing loss could be successfully treated with hearing aids, only 22 percent currently use them. Often neglected due to the stigma associated with the condition, hearing loss can create social and emotional barriers for the individuals living with it, or the families of those it affects. When left untreated, hearing loss can lead to reduced earning power, disruptions in family life and can cause a wide range of other psychological problems. If you are experiencing hearing loss, speak to a local hearing health professional who can do a full hearing screening and walk you through available solutions. Modern hearing aids are small, comfortable, nearly invisible and work with digital technology to ensure better sound quality and even wireless connectivity. The Audéo S Smart by Phonak, for example, is the world's smallest hearing system with full wireless functionality -- allowing you to connect to telephones, TV, MP3 music players and other audio transmitters at the push of a button. Modern hearing devices improve hearing ability, speech recognition and hearing comfort and have made it possible for those who need a hearing aid to wear their devices with ease and confidence. Custom models are made to fit the shape of your ear canal for maximum benefit, cosmetic appeal and the best possible comfort. These models are suitable for mild to severe hearing loss. Behind-the-ear models are available for all degrees of hearing loss and can be worn comfortably behind the ear. Incoming signals are amplified and transmitted into the ear via very small, unobtrusive tubes. If it's time to improve your hearing with a hearing aid, or you need to upgrade to a new one, here are three easy steps to choosing the one that's right for you. When deciding what hearing aid is best for you, it is important to consider the degree of hearing loss you have, the shape of your ear canals, your personal needs, your taste and your budget. Your local hearing health professional or ENT doctor can help you answer these questions. Your hearing health professional will adjust your hearing aid to your hearing loss and your hearing preferences. Over the first few days, you should wear it for a few hours per day to familiarize yourself with it. Take note on how you feel in different hearing situations. Additional fine-tuning might be necessary after your initial fitting. Just like glasses or contact lenses, a hearing aid can feel strange at first. This will change. Give yourself a little time to get used to it. You will learn how to make the best use of your hearing aid and will soon be enjoying all the benefits it has to offer. However, if you experience any problems or pain, please contact your local hearing health professional. For more about finding the right hearing solution for you, visit www.phonak.com. 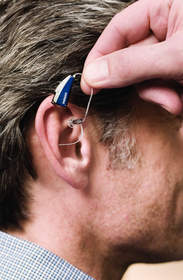 Technological advances have made it possible to house full wireless connectivity in one small hearing aid -- at the push of a button, you can connect a hearing device to telephones, TV, MP3 music players and other audio transmitters.